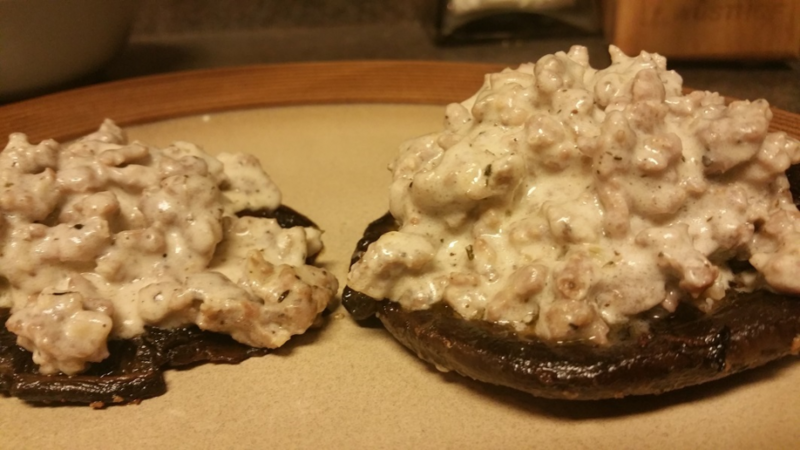 I’ve always loved mushroom/sausage combination, so I came up with this dish. Brown 1/2 a pound of breakfast sausage in a skillet. Once browned, add in favorite herbs such as sage and thyme. While sausage sauce is heating through, put 4 large portobello mushroom caps in another skillet in some butter over medium heat. Flip about 6 times until cooked, adding more butter if it gets dry. Sprinkle with garlic salt.